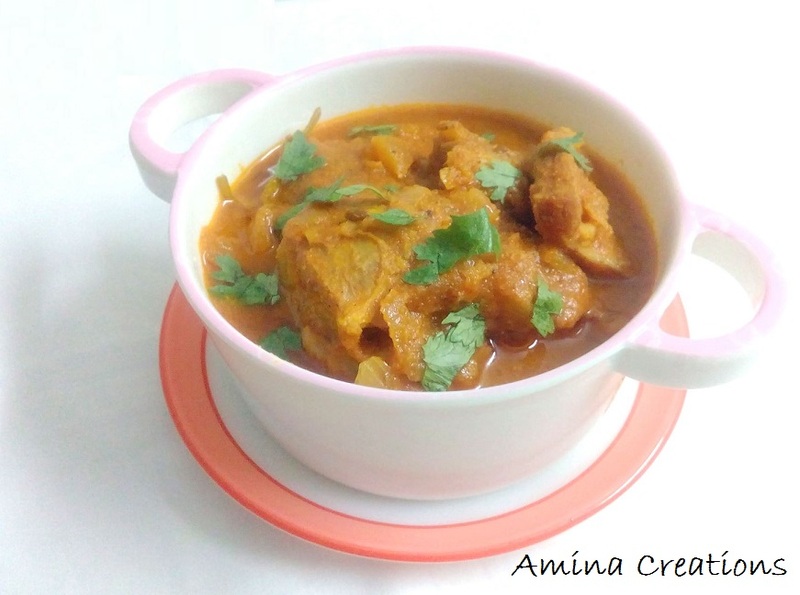 Andhra cuisine is known for its spicy and delicious taste and this curry Andhra mutton curry is no different. It is spicy, full of flavours and a great curry you can turn to when you wish to wish to make a spicy curry to go with both roti and rice. You can also check out the Andhra Chicken lollipops recipe which is equally delicious. For more mutton recipes you can also check out this page. Cover and set aside for 2 to 3 hours. Heat oil in a pressure cooker, add cardamoms, cinnamons and cloves long with chopped onions and saute till the onions turn golden. Add the mutton along with the marinade to this and mix well. Add all the masala powders along with salt and give a quick stir. Now add the pureed tomatoes and mix well. Cook for a couple of minutes in low flame till the oil starts separating. Now add coconut paste and coriander leaves and mix well. Check for taste, add salt or chilli powder if required and close the lid of the cooker. Pressure cook for about 10 minutes. By this time, the mutton would get cooked. Once all the steam has come out, open the lid and check if the mutton is cooked. If not, cook for a few more minutes. Once the mutton is cooked, bring the curry to a boil and cook for a few minutes in low flame so that the curry reaches a slightly thick curry consistency. Switch off the gas and transfer the Andhra mutton curry to a serving bowl. For more mutton recipes check out the mutton recipes page.